Home » NEWS » PRES DUTERTE REMARK: YES! TO CHINA AND RUSSIA JOINT MILITARY EXERCISE BUT NO TO UNITED STATES! MUST READ!!! PRES DUTERTE REMARK: YES! TO CHINA AND RUSSIA JOINT MILITARY EXERCISE BUT NO TO UNITED STATES! MUST READ!!! "This will be the last. It has been programmed," Duterte said. This is maybe the last exercise that will be holding under the Duterte's Administration. Wherein he commanded the troops of the United Sates to leave the country and end the war games with the Filipino Soldiers. 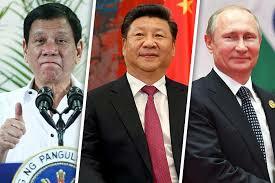 Hong Kong-based Phoenix Television: Asked Duterte if he will allow the joint military exercise between China and Russia: "Yes, I will. I have given enough time for the Americans to play with the Filipino soldiers." For a long time that the American had been an ally of the Philippines yet, nothing happens to the country and even the economic does not boost. So maybe it's time to open the mind of the Filipinos to trust in the Chinese people. Because the President believe that we will be more benefits if the Philippines will be tying to China and Russia. And also the Pres. Duterte is praising China and Russia for their "respect" on his campaign to illegal drugs. The Two big countries had to show respect to the President side, unlike United States, European Union, and United Nations are kept on criticizing the President on his move against the illegal drug. This big Allies and Unions seems like they look the Philippines as their little brown brother. They are not treating the Philippines as an equal country, instead seems to be less in their eyes.